The irritant contact dermatitis is a condition due to the rubbing of the skin with some type of chemical substance. 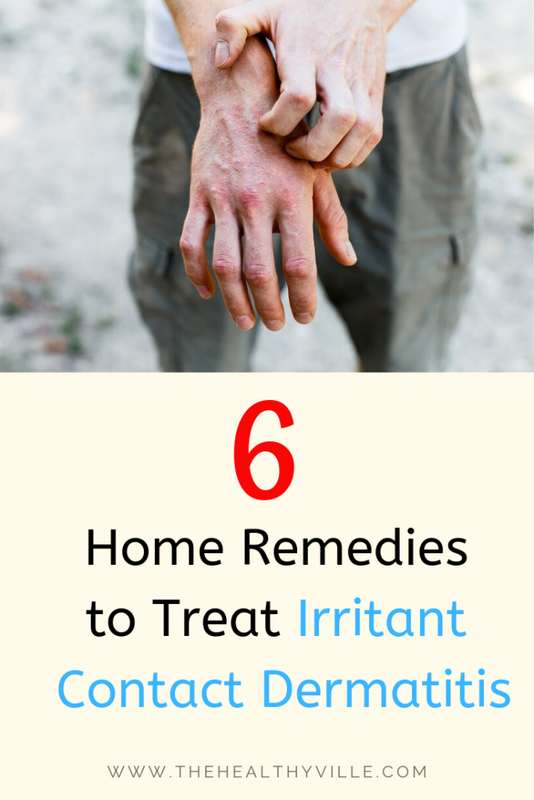 Learn how to treat it at home with natural anti-inflammatory and moisturizing preparations. Irritant contact dermatitis is a reddish rash on the skin that is caused by rubbing the skin with some type of chemical substance. The rash usually appears in minutes or hours after exposure and can last two to four weeks. It does not endanger life or is contagious, but it can be uncomfortable. Contact dermatitis has no cure, however its symptoms can be treated. Here we present some homemade solutions that control and combat their effects. Oatmeal is widely used in products such as soaps, shampoos and body creams since it allows to moisturize, exfoliate and leave the skin brighter. First, heat the water in a container. Then, add the oatmeal and stir. Finally, proceed to make baths with this solution. Another option is to place the solution in the refrigerator. When it is very cold, proceed to apply in the areas affected by dermatitis with a compress. Medical studies show that aloe Vera is useful to treat skin conditions. Just one of the most favored is contact dermatitis. Cut a leaf or aloe Vera. Next, apply directly on the affected area by means of massages so that the active components of the plant act on the skin. Chamomile is an herb widely used for the treatment of skin conditions since its components reduce inflammation and reduce burning. Simply apply over the area with the help of a cotton ball. You can also take advantage of the benefits of infusion in a bathroom. The flowers and leaves of mallow have essential properties for the protection of the skin against eczema, hemorrhoids and dermatitis, among other conditions. Subsequently, apply on the affected area with a piece of soft cloth to reduce inflammation and cool down. The cucumber has moisturizing properties and a high content of vitamin C. Therefore, it is used to refresh the areas affected by dermatitis, to lighten the skin and avoid spots that may cause the condition. Further info: What Health Benefits Do Cucumbers Have? Check Our List! In the case of dermatitis it is useful to apply cucumber slices directly on the irritated skin. Thyme is a culinary herb that tends to be antiseptic and moisturizing for the skin. This herb also has anti-inflammatory properties that help alleviate the discomfort caused by contact dermatitis. Its preparation in the form of infusion is identical to that made with chamomile. To apply it, just soak a cotton ball or take a bath in the affected area. Don’t forget to SHARE the remedies for irritant contact dermatitis with your friends and family on your social networks.